Welcome to the Caring Communities Project funded by the National Lottery Community Fund. As part of the project we will have launched 16 hubs providing local support and information for carers across Hertfordshire by April 2019. What are Carer Support Hubs? You told us that you wanted much stronger local support for carers and thanks to a grant of £200,000 from the National Lottery Community Fund (formerly the Big Lottery Fund) awarded in the year 2013/14 we have been able to provide a grassroots service run by carers for carers, to best meet your needs. The hubs are one-stop shop where you can find information about what is happening in your local area, get advice, support and make friends. We have 16 hubs running in Berkhamsted, Bishop’s Stortford, Borehamwood, Buntingford, Chorleywood, Harpenden, Hemel Hempstead, Hoddesdon, Potters Bar, Letchworth Garden City, Royston, St Albans, Stevenage, Ware, Watford and Welwyn Garden City. Our hubs are groups run by volunteers or carers for carers and focus on offering emotional and practical support. Most groups meet once a month and offer activities include a programme of speakers and time to talk. Carers can book 1:1 appointments with a Carers in Hertfordshire Carer Support Advisor at some meetings to plan their caring role. In addition to our Carer Support Hub groups many areas will have Peer Led Carer Groups, for example there is a Carers' Camera Club, a Pudding Club, plus support groups in areas such as Borehamwood and Bushey. You can find out about all these here - pdf Hubs and Peer Led Groups List 2019 (222 KB) . There are some evening groups including one in Hatfield at the Tesco Extra (Community Room) on the second Wednesday of each month from 7.30pm - 9pm. You can find out more about Hubs in our video An Introduction to Carer Support Hubs and there is also a video about the Stevenage Carers' Support group here which we have been supporting for a number of years. This will give you an idea of what a Carer Support Group will look like. 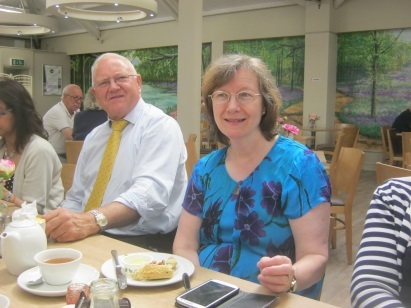 Watford Carers enjoy a cream tea. In addition each hub area will have Volunteer Ambassadors whose role it is to help identify new carers and to spread the word about what is available locally for them. 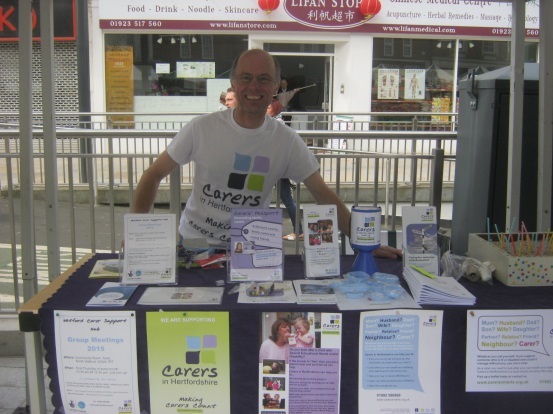 Volunteer Ambassador James promoting support for carers at a Community Event. Within each hub area you can also attend workshops to learn new skills and have a break from caring. Please click here to see what events are available. Click here to see a video of carers at our Singing course..
Thursday 4th April 2019, 10.30am – 12.30pm: The Watford Carers' Group meets that usually meets at Asda (Community Room), Watford, is going bowling at Hollywood Bowl, Woodside Leisure Park, Watford, instead. If you have a Carers’ Passport Discount Card you should be able to receive a discount. If carers do not want to bowl they can have a drink and a chat. Monday 8th April 2019, 10.30am – 12.30pm: Our Watford Carers Support Hub meets at Peace Hospice Care, Watford. This meeting there will be a discussion about looking after your back. Tuesday 9th April 2019, 10.30am – 12.15pm: Our Berkhamsted Carers Support Hub meets at the Swan Youth Project, Berkhamsted. This meeting there will be a talk about Hertfordshire Health Walks. Wednesday 10th April 2019, 10.30am – 12pm noon: Our Hemel Hempstead Carers Support Hub meets at the South Hill Centre, Cemetery Hill. This meeting there will be a talk about Hertfordshire Health Walks. Thursday 11th April 2019, 10am – 12pm noon: Our Borehamwood Carers Support Hub meets at Allen Manor House and Hall, Elstree. This meeting a Solicitor from Anvoner Solicitors will talk about Wills, Inheritance Tax, Lasting Powers of Attorney and more. There will also be the chance to have a one to one appointment with a Carer Support Advisor. Friday 12th April 2019, 11.15am – 1pm: Our Ware Carers Support Hub meets at new venue Allenburys Sports and Social Club, Harris’s Lane, Ware, SG12 0DJ. This meeting there be a talk about sepsis – the signs of the condition and how it is treated. The meeting is usually the third Friday of the month, but has moved for April because of Easter. Monday 15th April 2019, 10.30am – 12.30pm: Our Chorleywood and Rickmansworth Carers Support Hub meets at Christ Church, Chorleywood. This meeting there will be a talk by one of our Carers’ Camera Club participants. Tuesday 16th April 2019, 10.30am – 12.30pm: Our St Albans Carers Support Hub meets at St Paul’s Church, St Albans. This meeting there will be a talk about falls – how to avoid them or support someone who has had a fall. Wednesday 17th April 2019, 12pm noon – 2pm: Our Welwyn Garden City Carers Support Hub meets at the United Reformed Church, Welwyn Garden City. This meeting there will be a chair based yoga and relaxation session. Our Stevenage Carers Support Hub is to meet at a new venue in 2019 due to the previous venue being unavailable. The new venue is Springfield House Community Centre, 24 High Street, Stevenage Old Town, SG1 3EJ. The group meets the last Thursday of the month 10am - 12pm noon. Our Ware Carers Support Hub is to meet at a new venue in 2019 due to the previous venue being unavailable. Allenburys Sports and Social Club, Harris’s Lane, Ware, SG12 0DJ. The group will continue to meet on the third Friday of the month, but from 11.15am - 1pm (except the April 2019 meeting which will be on 12th April). From January 2019 our Harpenden Carers Support Hub will be meeting at a new venue. The Hub will meet at Batford Memorial Hall, 16 Tallents Crescent, Harpenden, AL5 5BS. The Hub will meet on the third Thursday of the month from 10am - 12pm noon. From September 2018 our Chorleywood and Rickmansworth Carers Support Hub will be meeting at a new venue. The Hub will be meeting at Christ Church Chorleywood, The Common, Rickmansworth Road, Chorleywood, WD3 5SG. The Hub meets on the third Monday of the month from 10.30am - 12.30pm. From August 2018 our Potters Bar Carers Support Hub will be meeting at a new venue. The Hub will be meeting at King Charles the Martyr Church, 368 Mutton Lane, Potters Bar, EN6 3AS. The Hub meets on the last Wednesday of the month from 10.30am - 12.30pm. There are lots of training opportunities for carers to take on a variety of voluntary roles when their local hub opens. You can also look at the volunteer roles available in the Caring Communities Project by clicking here (link to Volunteer Jobs page) To register your interest in any part of this project email or call 01992 58 69 69. One way we keep in touch with our Hub Volunteers is via newsletter and you can read our latest pdf Hub Volunteer Newsletter (1.04 MB) pdf (566 KB) here. Where: Bishop’s Stortford Baptist Church, Twyford Road, CM23 3LJ. Speaker: This month Emily Clowry with give a talk about Hertfordshire County Council’s Walking Scheme. Charlotte Janes, Carer Support Advisor, Carers in Hertfordshire, will attend to give 1:1 advice. Please think about any issues you want to bring. Charlotte may also offer support by telephone from the office if time runs out.